Missions has been a part of Africa’s story since just after Jesus ascended into heaven. By the middle of the first century, churches had been established in northern African by early converts to Christianity. Two thousand years later, Christian presence has left indelible marks on the continent—some positive, some less so. Here are ten ways missions has impacted Africa. In the fifteenth century, Christianity came to Africa’s coastlines through forts established by European slave traders. Chaplains were assigned to forts, but their role was to serve the Europeans, not to evangelize Africans. By the 1800s believers from Europe and America, enraged by the slave trade, began establishing Christian missions in Africa. It was fairly easy to raise funds to start the missions because of Christians’ compassion for the plight of slaves. Some of these early missionaries focused on ministering to freed slaves sent to Liberia and Sierra Leone while others evangelized indigenous populations. Some freed slaves who had embraced Christianity in America also worked to spread the gospel upon their return to Africa. 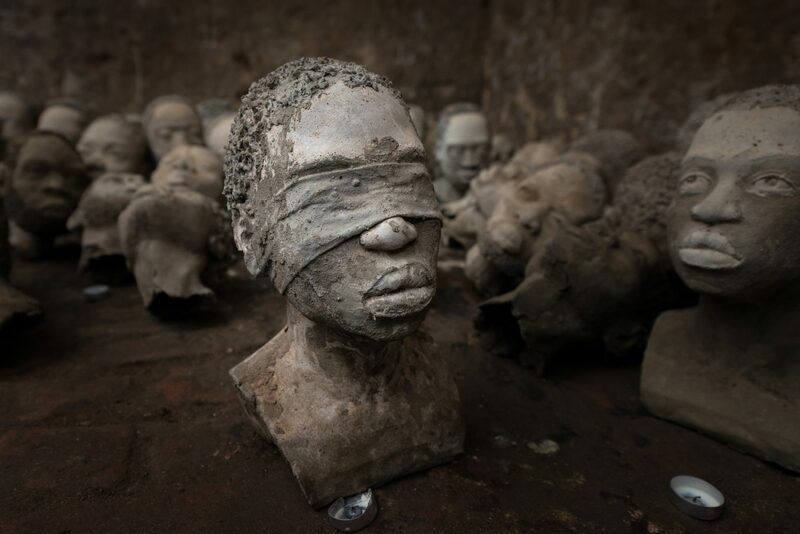 Clay heads in Cape Coast Castle dungeon depict pain and sufferings the captured slaves endured. Photo by Luke In. In 1850, US Baptist missionaries arrived in Nigeria to work among the Yoruba people. The Yoruba embraced the gospel and planted Baptist churches throughout western Africa as they traveled for trade. When they realized they were not effectively evangelizing other ethnic groups due to language and cultural differences, they asked Nigerian and US Baptists for assistance. Today, although many Nigerian churches embrace the prosperity gospel, most Yoruba Baptist churches remain theologically solid. The Nigerian Baptist Convention—the second largest Baptist convention in the world—is composed primarily of Yoruba churches and sends both national and international missionaries. The spread of the gospel through foreign missionaries often occurred simultaneously with the spread of colonial rule by European nations. The British, French, and Portuguese, spurred by the desire to expand empires and mine resources, dominated Africa in the 1800s and 1900s. Missionary efforts, though not necessarily tied to government activity, began concurrently and are sometimes considered as one and the same. Though the missionaries’ primary aim was to bring the gospel to Africans, some Africans consider Christianity a “white man’s religion” that was used to subdue and control them in the process of colonization. Scottish explorer Dr. David Livingstone is well-known for marrying his colonial and missionary motives. In the 1800s he explored the African interior under the motto “Christianity, commerce, and civilization.” His goal was to open up new river routes so the slave trade could be abolished through legitimate trade and the embracement of Christianity. Livingstone is considered a national hero in Zambia because of his desire to improve the lives of Africans. When he died, his African attendants buried his heart under a tree in Zambia before transporting his body over one thousand miles to Britain for burial. Today, due in large part to Livingstone’s legacy, Zambians are generally sympathetic to the message of missionaries and see themselves as having a Christian heritage. Missionaries who followed in Livingstone’s footsteps by addressing both spiritual and physical needs have had a profound impact on the continent. Hospitals established and often run by missionaries are frequently the only available source of health care, particularly in rural areas. Countless children have been and continue to be educated in schools established by missionaries. In South Africa, for instance, mission schools started educating African children in the mid-1800s, almost a century before government schools were built for them. Patients from all over Zimbabwe come to Sanyati Baptist Hospital for treatment because they know they will receive quality care and will not be turned away even if they can’t pay. Photo by Nicole Clark. Schools emphasized literacy because the ability to read offered Africans both the opportunity to study the Bible and to advance in society. Many young people educated in mission schools became leaders in the fight for independence, including Nelson Mandela in South Africa and Julius Nyerere in Tanzania. Unfortunately, the emphasis on reading gave the impression that literacy was necessary to learn Scripture, and uneducated people were unintentionally alienated. Missionaries had not yet embraced traditional oral teaching methods like stories and songs, as many have today. Missionaries have often unwittingly imported their cultural preference into the churches they started. Early African churchgoers were taught to sing hymns accompanied by a piano and to listen to sermons while sitting on rows of benches in a concrete building. Well-meaning Westerners simply mimicked their own church experiences rather than encouraged Africans to develop their own practices. Today, many established churches continue to operate in a Western fashion, even as some newer churches are choosing to worship with drums and dance or to teach God’s Word using call-and-response patterns while sitting on mats under trees. The desire to train African church leaders led to the establishment of seminaries and Bible schools. Unfortunately, African pastors often were not empowered to be self-theologizing—that is, to examine Scripture and develop contextualized answers to the African church’s questions. While seminaries offered insight into complex topics like the assurance of salvation, Africans are often more concerned with day-to-day concerns, like “How can I be cured of this illness?” Now African believers are increasingly turning to the “health, wealth, and prosperity” teachings of televangelists and modern-day “prophets” who are tuned in to the everyday wants and needs of African people. In the 1990s, IMB missionaries pulled out of many seminaries, schools, and hospitals in order to focus on evangelism and church planting among unreached peoples—ethnic groups with few or no believers and little or no access to the gospel. In the past six years alone, 105,039 people became believers and 890 churches were planted among unreached peoples in Sub-Saharan Africa. Praise God for these new believers who will worship in the throne room of the Lamb! Today many countries, particularly in southern and central Africa, claim to be at least 80 percent Christian. Although some Africans who profess Christianity actually follow a mix of biblical teachings and animistic or neo-Pentecostal practices, there are also millions of faithful believers. Thanks to the efforts of missionaries and African believers who have diligently shared the gospel over the past two millennia, Africa is forever changed. In fact, it’s predicted that almost 40 percent of the world’s Christians will reside in Sub-Saharan Africa by the year 2050. The question is, what kind of Christians will they be? IMB missionaries and indigenous believers are striving to ensure they are Great Commission-minded Christians whose faith is both Scripturally solid and culturally relevant. A pastor leads a Bible class at Liberty Baptist Church in Bidibidi Refugee Settlement in northwestern Uganda. Rev. Edward Dima, president of the South Sudanese Baptist Convention, has opened a Bible school in the camp to provided theological education to leaders who are planting churches in the refugee camp blocks. Photo by William Haun. Examining the mistakes and successes of the past offers insights into how to work in Africa more effectively. As a result, missionaries are re-forming partnerships with seminaries and working alongside African leaders to teach sound theology that filters down into churches. They are embracing oral strategies, training believers to share the gospel in local languages through traditional methods like story and song. While continuing to serve unreached peoples and places, they are also renewing efforts to disciple existing believers, empowering them to take the gospel to their own people and around the world. What part will you play as missions continues to influence Africa? Melanie Clinton is a writer for IMB. She lives in Sub-Saharan Africa with her husband and two children.